Teacher Feature: Catherine Boisvert (CQSB) and Shanna Loach (ETSB) – What is Gamification? What is Gamification: Gamification can be defined as taking a closer look at the engaging and motivating aspects of video games and then applying these elements to a learning environment. Gamification is NOT about playing games in the classroom. What is Catherine’s project? Catherine and I began collaborating on a project to “gamify” elements of her FSL classroom. 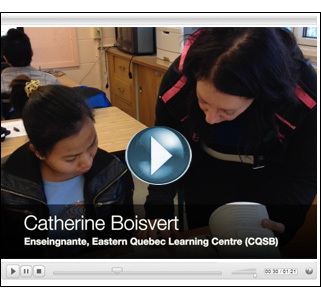 Catherine was looking for a new way to engage her individualized learners, as seen in the following video (in French): Want to know more about Catherine’s project? You can read more about our experience by reading “All Fun and Games: Gamifying a Language Classroom” on the LEARN blog. The article provides an overview of gamification and what worked well (and didn’t!) so far in our project. How does it work? In a nutshell, a Gamified classroom should present students with a clear outline of the course goals in addition to providing students with a system to recognize their efforts as they go along. A gamified classroom should encourage learning from mistakes, choice when to tackle different topics, more feedback, differentiation, and allowing students to progress at their own pace. Additional Gamification resources: I maintain a collaborative gamification board on Pinterest with my colleague Marc-André Lalande. There’s lots of great videos, web links, and also a link to our recent presentation at AQIFGA 2014. Comments: What have you heard about gamification? Do you think it would work well in your classroom? Questions? Concerns? Please feel free to leave a question or comment below! Special thanks to Sylwia Bielec for interviewing us and featuring us on the LEARN blog. 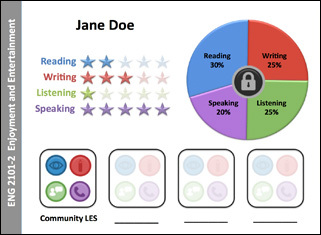 This entry was posted in Teacher Feature and tagged gamification, gamify. Bookmark the permalink.